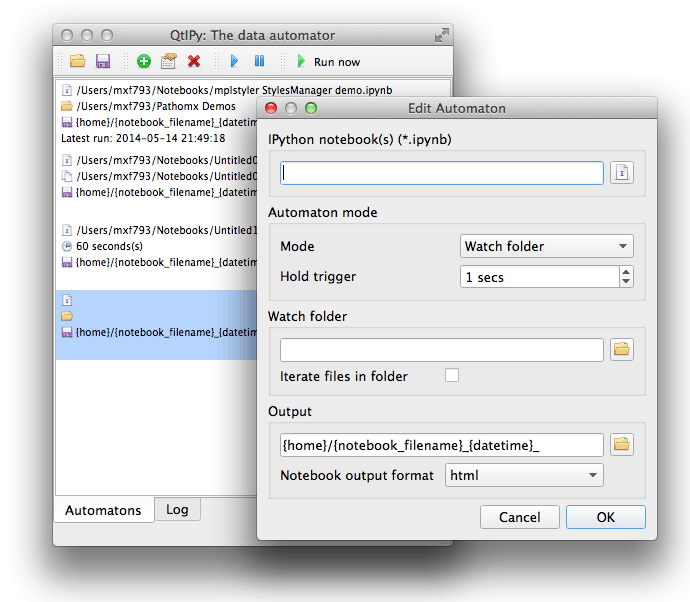 IPython notebooks are great for interactively working through analysis problems, so why would you want to automatically run them? To get a record of how you ran your analysis! 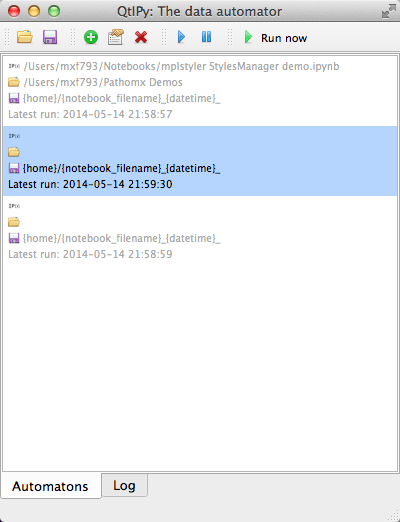 By running a notebook through QtIPy you get the output, figures and a step by step log of how the analysis was performed all in the same folder. A dictionary of variables describing the current state is passed to the script (as a variable named qtipy) and can be used to control inputs, outputs and behaviours in the script. Watching a folder optionally iterates over all the files in a folder, which are also passed (in turn) to the notebook for processing. Using the triggers and variables, QtIPy allows you to automatically process data files, generate figures, etc. without lifting a finger. Automator sets can also be saved and loaded for future use. Errors and progress is automatically logged to the log window. Automators can be paused to stop them processing, activated and run immediately. Requires PyQt5. Compatible with both Python2.7 and Python3.4. The back-end running is powered by runipy, which is a great tool for running notebooks and getting output from the command line. 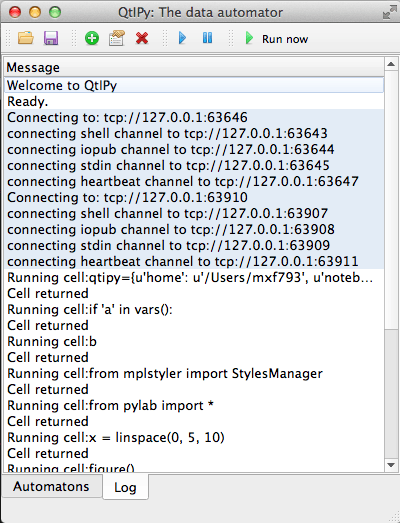 QtIPy requires PyQt5. Compatible with both Python2.7 and Python3.4. For Mac users a launcher .app is available for download from here. Install as above, then download the .app and drag to your dock. Click to launch QtIPy!